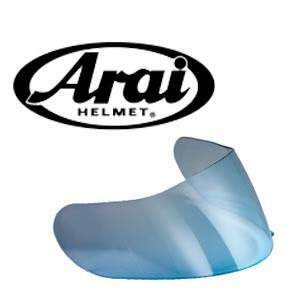 We supply the full range of Genuine Arai visor models available in a selection of colours including Clear, Dark Tint & Iridium finish which come with a full manufacture warranty. Most of the Arai range now also come Pinlock prepared so that you can install the Pinlock anti-fog insert. You can check which visor fits your model of Arai Helmet below. If unsure please contact us before you make your purchase. The Arai Tour X 4 Visor is the Genuine official replacement visor with the eyebrow vents which can be used for all the earlier Arai Tour X helmets and offers all of the quality and performance we have come to expect from Arai. Available in Clear, Light Smoke and Dark Smoke this official range of visors comes Pinlock ready so that you can use it with the revolutionary Pinlock inserts. Fits the following models of Arai Helmet: Chaser, Viper GT, 2011 Axces, Astro Race, Quantum (S,E,F,J), RX-7XX, RX-7RR4, NR2, NR3, Omni, Rapide (3), RV, Astro-J, Adsis L4, Corsair, SV, Astro Light. Riders Offshore is an online store based in the United Kingdom, specialising in genuine Shoei Visors, Shark Visors, Airoh Visors, HJC visors, pinlock, motorcycle helmets and motorcycle accessories.